Four cylinder front wheel drive automatic. Hello, I am working on a air conditioning system that the compressor will not come on. I fixed a broken wire going to the compressor, fuse is good. Voltage at that plug varies from 4 to 11 volts. I can jump the compressor with a another source of 12 volts and it will run. I ran it long enough to put in one can of 134a. I found a two wire plug on the accumulator/dryer and checked it for voltage of 13 to 14 volts with the car running. I jumped it across and the cooling fan came on. I found a four wire plug on the high pressure line and decided to stop there because I do not have a repair manual or a schematic to pursue this further. Please advise. Thanks. They call it a constant control module. Check out the diagrams (below). Please let us know what you find. Thanks! You guys are the best. I did what you said and replaced the module everything working great! I love this site. We have tried just about everything. Fuses, direct hot wire, pressure switch, checked gas. A direct hot wire is the only way to make the compressor kick in. We bypassed the pressure switch and still nothing. Everything else on the control panel works. Just not the air. Suggestions? Check wiring since you have do not every thing else. Check if you have short. I was told a bad compressor burned up the CCRM. $1,400.00 for shop repair is more than the car is worth. 1) What tips do you have to replace the compressor myself? 2) I have read elsewhere that I can drill open the CCRM and replace a relay to fix rather than spend $200.00 on a new one. Any thoughts on that? 3) What else does the CCRM control? Can I take it out and work on it at my leisure or is it imparative for other car funcitons? Thanks for the reply. The AC was totally inoperable. Compressor would not turn on. The shop tested pressure and relays, all were fine. Refrigerant was fine. They replaced the CCRM and the compressor started up but shook violently. They said the compressor was bad and shorted out the CCRM. Both would need to be replaced. Everything else works fine on the car. Yes. The AC has been working just fine. It just stopped working one day. One day it worked. The next it did not. My daughter was driving it at the time and did not notice anything dramatic that happened, but that would not be unusual. Since I am going to shell out another $25.00 to have the system checked I gather you are confident that the original diagnosis is not accurate and I can save some cash by investing in another diagnosis. I cannot get my air conditioning to work. My fan belt snapped and it sheared through the wiring to the compressor which blew the fuse. I took it to an air condition mechanic who said the compressor had seized this has now been replaced, still not working any power getting to the compressor. I have changed the relay under the dash, still not working. Apparently there is no power getting to the cylindrical box under the bonnet, any other fuses or relays between the relay behind the fuse box and this box under the bonnet. I will be out of town next week so I will get this taken care of the week after. Thanks for being there! Hi, do you have a light on dash or switch, when you turn on air? 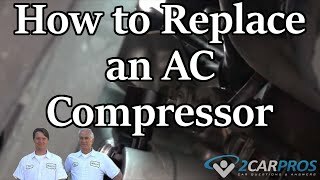 What tips do you have for replacing the compressor? If that does need to happen. I have replaced alternators, starters, radiators, etc, but have not worked on AC systems. Do you have a step by step process? Anything to be aware of with refrigerant? What kinds of connections do AC lines to the compressor employ? Thanks! You have been very helpful! Hi, yes the light comes on and so does the cooling fan. Well, I am heading out early tommorrow morning and since I wanted to know a bit more about AC repair I thought you could help. Good reading on a plane. Sorry to be a bother. Okay, there is a tank on the firewall or near it is a aluminum tank there is a low pressure switch on it. Turn your A/C on and wiggle this plug if do not come on unplug it and screw it off now screw it back on and plug back in if does not come on. Unplug and jump this plug comp runs. Either low on Freon or switch is bad. Write back if you need to, billymac. I am back! I hope you are still around! I got back from the shop. Hey hooked up the gauges, bypassed the CCRM and attempted to charge the system for a reading. The refrigerant was leaking rapidly through the front seal on the compressor so they were not able to get any readings. So, the compressor obviously needs to be replaced. Could you please send me some step by step instructions as to how to proceed to replace the compressor. I guess that will be our first step and then you can take me throgh a diagnosis of the rest of the system for next steps. Oh, sorry. I thought that was one of those rhetorical questions that only became relevant if there was body damage. What specific manual do you reccomend? I am new to this forum and I am at wits end with this diagnosis. I have a 2.0L with 108,000 miles. I have recently had trouble with the A/C cutting on and off randomly and on settings that it should not cut on at (for example defrost or vent). I have had a vacuum and leak test on the compressor witch came back okay. I had the old Freon captured and new Freon added. All of this to no avail. I also tried to start the compressor by jumping the low pressure plug. I did put a test light to the plug that plugs in the back of the compressor from which it sad it was not getting any power. As I said previously the A/C will cut on and off random on various settings such as vent, or defrost and of course the traditional A/C and Max A/C settings. Any suggestions at this point would help. It might be worth noting that I had an after market CD player installed some time back from which a new control panel was installed so the CD player would fit. Thanks again for any suggestions. Guess no one want to offer any comments on this one. Well from reading other post I will try to take a look at the CCRM seems like the most logical thing left for me to try. Any other suggestions would still be helpful. Does the compressor cycle when the switch is off (winter)? How often?